A stoneground flour milled from wholegrain buckwheat which is grown, stored or processed adjacent to wheat and other cereals. Traditionally used for pancakes and pasta. In times gone by buckwheat, fagopyrum esculentum, has been called sarrasin and black wheat due to the black outher casing of the triangular seeds. Buckwheat is a member of the rhubarb family which ripens in late autumn. It is a traditional food in Russia where it is known as kasha, as well as featuring in dishes from Northern China, Tibet and Europe. The flour has a calico colour and natural sweetness which can impart a pleasing flavour to noodles, pancakes, pasta and home baking. 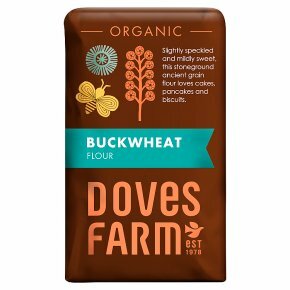 Baking with Buckwheat Flour Buckwheat flour is well suited to cake and biscuit baking For bread baking combine buckwheat flour with a strong bread flour.